If you are a blogger then I am pretty sure often times you may add external links into your posts for reference or to link media files. Do you know whenever you add an external link into your posts, pages or within the website, actually you are giving some SEO authority and passing link juice to linked websites? It is good practice for SEO perspective to add links which should have good authority and PR or at least linked site didn’t spam on the internet. High authoritative external links also help you to rank your site better in the eyes of search engines. If you have no idea about the added link is good or bad from SEO sake then simply add a rel nofollow attribute for that link. Otherwise, as I said earlier when you linked an external URL, you’re passing link juice and authority from your site to the linked URL. Ignoring this point of view may cause you losing ranking. How to Optimization Images for WordPress Site? In this article, I will show you how to add rel nofollow checkbox in wordpress insert/edit link section. So, with the help of this nofollow checkbox, you can easily add “rel=nofollow” tag in any external link. There are numbers of free wordpress nofollow plugins available in wp plugins repository to insert or add nofollow box to insert links section. All you need to do is, go to your WP dashboard and then Plugins>Add New plugin, search for “Rel Nofollow Checkbox” install and activate it. This plugin work out of the box and there is no need of any configuration like some other wordpress plugins such as Yoast WordPress SEO, SEO Friendly Images or Wordfence Security who needs to configure before to get maximum benefits. After activation go to post visual editor and click insert/edit link button located at the top of visual editor bar. You will see a checkbox named rel=nofollow, whenever you want to add a nofollow attribute in any link, just tick this rel=nofollow box. 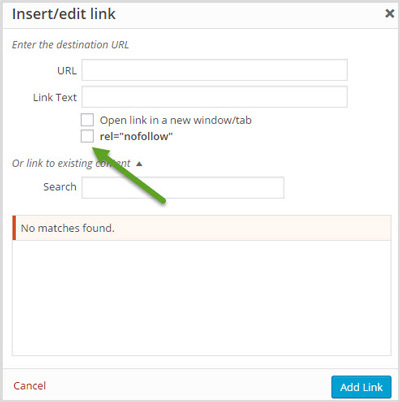 I hope this article will help you to add rel nofollow attribute for external links in your blog articles. Have any question regarding this article? Don’t hesitate and leave it below in the comment section.